Moti Masjid in Agra stands on a ground that descends from east to west to the north of Diwan-i-Aam complex in Agra Fort. There are a series of Hindu-style domed kiosks along the parapet. There are seven bays that are divided into aisles which are supported by peers and lobed arches. The Moti Masjid boasts of extensive white marble facing, a type of the Mughal brand of architecture much in the era of Shah Jahan. Pay a visit to witness this world famous Mughal architectures. Create your own Agra vacation packages or choose from the ones made by travel experts. Also explore the best ways for how to reach Agra. People normally club together Kd Paliwal Park and Tomb Of Mariam Zamani while planning their visit to Moti Masjid. The Moti Masjid is a white marble mosque inside the Red Fort complex in Delhi, India. The name translates into English as "Pearl Mosque." Located to the west of the Hammam and close to the Diwan-e-Khas, it was built by the Mughal Emperor Aurangzeb from 1659-1660. Agra Fort is a historical fort in the city of Agrain India. It was the main residence of the emperors of the Mughal Dynasty until 1638, when the capital was shifted from Agra to Delhi. Before capture by the British, the last Indian rulers to have occupied it were the Marathas. The Agra fort is a UNESCO World Heritage site. It is about 2.5 km northwest of its more famous sister monument, the Taj Mahal. The fort can be more accurately described as a walled city. Moti Masjid is one of the mosques that was built during Shah Jahan . Moti in the local languages means pearl .It's really wow. 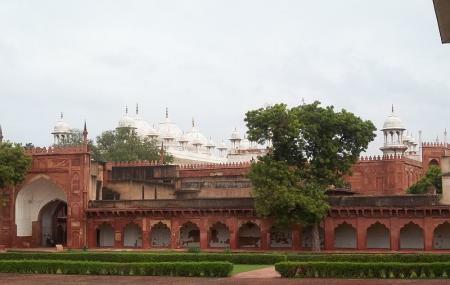 Moti Masjid stands on ground that slopes from east to west to the north of Diwan-i-Aam complex in Agra Fort. The courtyard of the Moti Masjid has side arcades and arched recessions and the main sanctuary facade beyond. The sanctuary is roofed with three bulbous domes built of light white marble and stand on the red sandstone walls. There are a series of Hindu-style domed kiosks along the parapet. There are seven bays that are divided into aisles which are supported by piers and lobed arches. The Moti Masjid boasts of extensive white marble facing, a typical stylistic feature of architecture during the reign of Shah Jahan.